In a ceremonial showcase of performance, the Macquarie University 2017 Blues Awards were held on Wednesday 25 October. 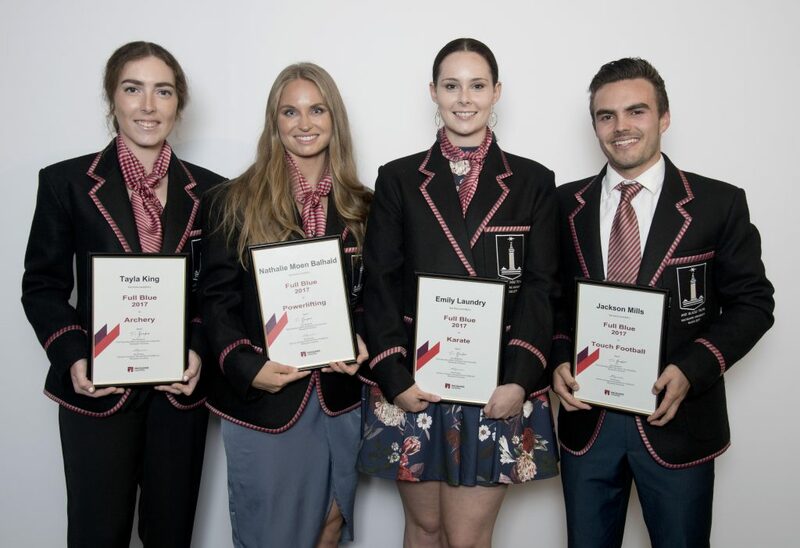 A number of athletes were recognised for their outstanding achievements athletically and academically while representing Macquarie University, their state or nation across the past year. Former Olympic Gold medallist and OAM Brooke Hanson was the Master of Ceremony, with Macquarie University Chancellor Michael Egan and Vice Chancellor Professor Bruce S Dowton also in attendance. “The annual Blues Awards is a fantastic opportunity to celebrate and recognise outstanding sporting and academic achievements, and in 2017 Macquarie University students showcased another successful year in which their achievements continue to reach new heights. Since the inception of the event our Blues evening has continued to grow, providing greater opportunity for our twelve Blues, and six award recipients to be acknowledged by their academics, peers, alumni, family and friends” said Rob Tweddle, Acting General Manger Sport and Recreation. Four athletes were awarded the highly prestigious Full Blue Award and eight received a Half Blue Award. Five athletes, one club and one sport administrator received recognition with other major awards, including the Female and Male Sport Athlete of the Year and the prestigious Chancellor’s Award. The Full Blues winners were; Nathalie Moen Balhald, Tayla King, Emily Laundry and Jackson Mills. The Half Blues winners were; Lachlan Anderson, Nicholas Andrews, Chantelle Kerry, Peter Livingstone, Kyle Mcindoe, Belinda Maxworthy, Steiner Ahn Nguyen and Thomas Schramko. Female Sport Athlete of the Year – Dominique Du Toit. Dominique was a member of the squad that won Gold at the 2016 Olympics in Rio, Brazil, and has spent 2017 playing for Australia in the World Rugby Sevens Series. She played for the Macquarie Sydney Rays in the inaugural AON Women’s University Sevens Series. Male Sport Athlete of the Year – Nicholas Brooks. Nicholas is a current member of the Australian Men’s National Water Polo team who recently finished seventh at the 2017 World Championships. Nicholas was selected in the Australian team to compete at the 2017 World University Games and recently attended the 2020 Olympic hopeful camp for the Australian Men’s team. The Rookie of the Year – Deanna Kyriazopoulos. This award recognises high-level sport performance by a student in their first year of study at Macquarie University. As a current member of the Australian Senior Taekwondo National Team, 46kg representative Deanna is ranked 28th in the world in her division. She made history this year as the first Australian athlete to compete at the Asian Indoor Games and she was chosen by the Australian Olympic Committee to be Australia’s first flag bearer at the event. Club of the year – Squash Club. 2017 marks the clubs 50th year and they have gone from strength to strength, becoming the largest University Squash club in Australia. In 2017 the club has engaged the University campus and wider community through participation in multiple on campus events, including open tournaments, internal competitions, learn to play and social sessions. The prestigious 2017 Macquarie University Chancellor’s Award was presented to Dominque Du Toit. In addition to Dominique’s outstanding performance on the field in the Australian Women’s team which earned her the Female Athlete of the Year Award, she was also named a Macquarie University Sport Ambassador in 2017. The John Lincoln Services Award, which recognises long term volunteer service to a Sport Club, Sport Program or Unisport event, was presented to Yagiz Alp Aksoy from the Table Tennis Club. MQ Sport’s most prestigious scholarship, The Ted O’Keeffe Scholarship was presented to Thomas Green. In 2017 Thomas has been racing domestically and internationally with the GPM-Stulz Racing team. After competing in nationals and the New Zealand Cycle Classic in early 2017, he is currently competing in the National Road Series and looking forward to the summer period racing in France. Tom has previously focussed on the discipline of cyclocross where he represented Australia in the World Championships.